Curated Maria Hassabi‘s “SHOW” into the River To River Festival in 2012. 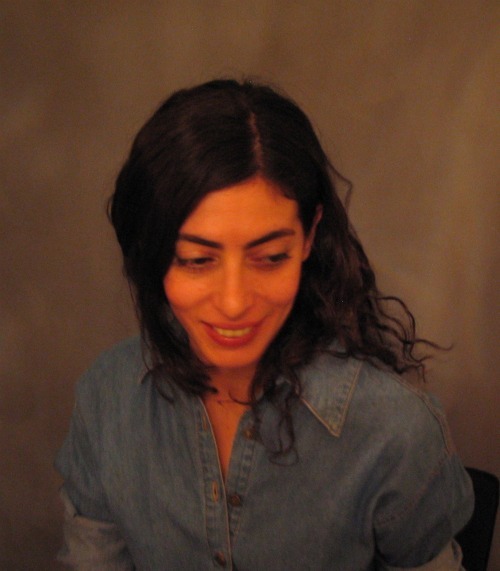 Maria Hassabi is a New York-based director, choreographer and performance artist. Over the past ten years, she has developed a practice involved with the relation of the body to the image—defined by sculptural physicality and extended duration. Her works are presented in theaters, museums, galleries and public spaces. Throughout her career she’s had ongoing collaborations with artists from various disciplines. Hassabi is a 2011 Guggenheim Fellow and a recipient of the Foundation for Contemporary Arts, 2009 Grants to Artists Award. In 2012, she received The President’s Award for Performing Arts from the LMCC, and in 2013 she represented The Cyprus Republic as part of The Cyprus and Lithuanian Pavilion at the 55th Venice Biennale. Her evening length works include PREMIERE (2013), the 8-hour long live installationINTERMISSION (2013), Counter-Relief (Kaai 2013), SHOW (2011), Robert and Maria(2010), SoloShow (2009), Solo (2009), GLORIA (2007), Still Smoking (2006), Dead is Dead (2004) and LIGHTS (2001). She has also created several short-form pieces, art installations including CHANDELIERS (2012), and a short film, The Ladies (2012). Hassabi’s works have been presented in the US at venues such as Performance Space 122, The Kitchen, Dance Theater Workshop, Danspace Project, PS1 MoMA, CCS Bard Galleries at Bard College (Hudson, New York), Ballroom Marfa (Texas), Portland Institute for Contemporary Art TBA Festival (Oregon), Museum of Contemporary Art Chicago, Herberger College of the Arts at Arizona State University, and featured in the Visual Art Performance Biennial Performa 09 and 13, the French Institute Alliance Francaise Crossing the Line festivals in 2009 and 2011, and LMCC’s River to River Festival in 2012 and 2014. Internationally, she has been presented at venues such as Museo Soumaya (Mexico City), Centre d’Art Contemporain Geneva (Switzerland), Kaaitheater (Brussels, Belgium), deSingel (Antwerp, Belgium), Middleheim Museum (Antwerp, Belgium), Vienna Art Fair (Austria), Musée Géo Charles (Grenoble, France), Beit Hair Center for Urban Culture (Tel Aviv, Israel), Frascati Theater (Amsterdam, Netherlands), Balletto Teatro di Torino (Turin, Italy), and at festivals such as Kunstenfestivaldesarts (Brussels, Belgium), Springdance Festival (Utrecht, Netherlands), ImPulsTanz (Vienna, Austria), Tanz im August (Berlin, Germany), steirischerherbst (Graz, Austria), Le Mouvement: Performing The City (Biel, Switzerland), Göteborgs Dans & Teater Festival (Göteborg, Sweden), XING (Bologna, Italy), Nottdance and NEAT Festival (Nottingham, UK), In-Presentable Festival (Madrid, Spain), TSEH- Springdance/Dialogue (Moscow, Russia), City of Women Festival (Ljublana, Slovenia), Volcano Extravaganza 2013 – Evil Under The Sun (Stromboli, Italy) and festivals in Bosnia-Herzegovina, Cyprus, Greece and Portugal.